Geoff Hindle had a cleanup in his shed a few weeks ago. Look at what he found! Thank you Geoff, for donating this artists paint box to Russell Museum. It was made by English firm Winsor and Newton – “By appointment to Her Majesty Queen Victoria and the Prince and Princess of Wales”. Early boxes were by appointment to “Her Majesty and to his Late Royal Highness the Prince Consort”. Prince Albert died in 1861. In the box are some surviving examples of the first ‘moist’ watercolours which utilised the moisture-retaining properties of a recently discovered material, glycerine. Prior to this watercolour painters had to make paints themselves using pigments purchased from an apothecary. The earliest commercial paints were small, resinous blocks that had to be wetted and laboriously “rubbed out” in water. In the late 1880s Winsor Newton developed permanent colours. They began labelling these with “SL” for their Select List of permanent watercolour paint. One of these blocks, in its own porcelain pan, is still in this box. 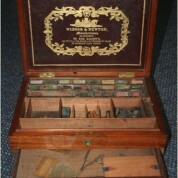 We have therefore tentatively dated the box and its contents to between the 1880s and 1901 (when Queen Victoria died). We think it was probably owned and used by James Yearbury, who lived at 4 Florence Ave until 2008.